The storm continued to crawl westward, dumping more than 75 centimetres of rain since Friday, and fears of historic flooding grew. Tens of thousands were evacuated from communities along the state's steadily rising rivers. Wilmington: Catastrophic flooding from Florence spread across the Carolinas on Sunday, with roads to Wilmington cut off by the epic deluge and muddy river water swamping entire neighbourhoods miles inland. “The risk to life is rising with the angry waters,” Gov Roy Cooper declared as the storm’s death toll climbed to 17. The storm continued to crawl westward, dumping more than 75 centimetres of rain in spots since Friday, and fears of historic flooding grew. Tens of thousands were ordered evacuated from communities along the state’s steadily rising rivers — with the Cape Fear, Little River, Lumber, Waccamaw and Pee Dee rivers all projected to burst their banks. In Wilmington, with roads leading in and out of the city underwater and streams still swelling upward, residents waited for hours outside stores and restaurants for basic necessities like water. Police guarded the door of one store, and only 10 people were allowed inside at a time. Woody White, chairman of the board of commissioners of New Hanover County, said officials were planning for food and water to be flown into the coastal city of nearly 120,000 people. “Our roads are flooded,” he said. “There is no access to Wilmington.” About 115 kilometres away from the coast, residents near the Lumber River stepped from their homes directly into boats floating in their front yards; river forecasts showed the scene could be repeated in towns as far as 400 kilometres inland as waters rise for days. Halfway around the world, meanwhile, Typhoon Mangkhut barreled into southern China on Sunday after lashing the Philippines with strong winds and heavy rain that left dozens dead. More than 2.4 million people were evacuated from China’s southern Guangdong province ahead of the massive typhoon, the strongest to hit the region in nearly two decades. In North Carolina, fears of what could be the worst flooding in the state’s history led officials to order tens of thousands to evacuate, though it wasn’t clear how many had fled or even could. The storm’s death toll climbed to at least 17 when a 3-month-old child was killed when a tree fell across a mobile home in North Carolina. Earlier, officials said three people died in separate, weather-related traffic accidents in South Carolina. As rivers swelled, state regulators and environmental groups were monitoring the threat from gigantic hog and poultry farms located in low-lying, flood-prone areas. The industrial-scale farms contain vast pits of animal faeces and urine that can pose a significant pollution threat if they are breached or inundated by floodwaters. In past hurricanes, flooding at dozens of farms also left hundreds of thousands of dead hogs, chickens and other decomposing livestock bobbing in floodwaters. Authorities ordered the immediate evacuation of up to 7,500 people living within a mile (1.6 kilometers) of a stretch of the Cape Fear River and the Little River, about 100 miles (160 kilometres) from the North Carolina coast. The evacuation zone included part of the city of Fayetteville, population 200,000. Fayetteville city officials, meanwhile, got help from the Nebraska Task Force One search and rescue team to evacuate 140 residents of an assisted-living facility to a safer location at a church. Rainfall totals were stunning. 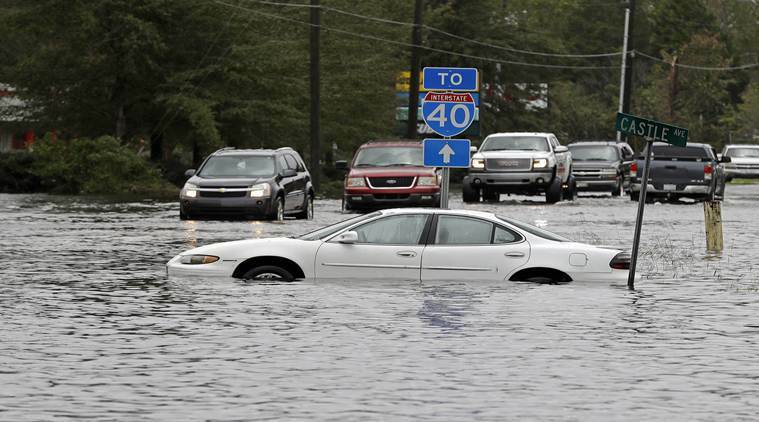 In Swansboro, North Carolina, nearly 85 centimetres of rain had fallen by Sunday afternoon and 20 other places in North Carolina had at least 20 inches, according to the National Weather Service. Another 30 sites in North and Carolina had at least 25 centimetres. Water on the Cape Fear River near Chinquapin got so high that electronic instruments used to monitor flooding quit working after it became submerged, the US Geological Survey said. The same thing happened on the Trent River. Still, there was some good news: Power outages in the Carolinas and Virginia were down to about 580,000 homes and businesses after reaching a high of about 910,000 as the hurricane ploughed into the coast. Utilities said some outages could last for weeks.